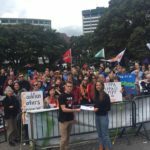 Opposition to the Trans Pacific Partnership Agreement will again see people on the streets of Wellington and 21 other towns and cities on Saturday. 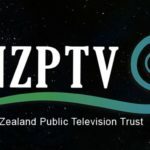 Wellington City Councillor Sarah Free, NZ Council of Trade Unions secretary Sam Huggard and medical and health sector representative Dr Gay Keating will be among the speakers at the protest starting 1pm at Lambton Quay’s Midland Park and marching to Parliament. The TPPA will give foreign investors wanting to protect their profits the power to sue the New Zealand Government in secretive international tribunals outside our own laws and courts. 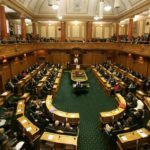 The Investor State Disputes Settlement provisions of the TPPA will be a focus of the Wellington protest on Saturday. While John Key likes to promote how clean New Zealand rivers are, would he be able to stop any attempt to frack for oil under the Waikato River? The Canadian Government is being sued for $125 million dollars by US company Lone Pine after the Government put a 12 month moratorium on fracking under the St Lawrence River. While we are told that secrecy is necessary during the negotiation process 600 US corporate lobbyists are given access to drafts of the agreement that the rest of us – including Parliamentarians – are not allowed to see. The TPPA is clearly addressing the interests of large international companies against the interests of the citizens and the democratic process. Trade Ministers of the TPPA countries are to meet in April to try to finalise a deal that needs agreement by mid-year for the TPPA to pass during US President Obama’s presidency. There is huge pressure to make dangerous compromises in order to end the negotiations.